If someone looks pallid she or he looks very pale in an unattractive and unhealthy way. That which is in the vanguard is in the leading spot of something, such as an army or institution. The sun had reached its zenith, straight over our heads. It was so hot I thought I’d pass out, but our leader’s enthusiasm for the hike had not yet reached its zenith or topmost point, so he unfortunately urged us on. After miles of marching our agony reached its zenith or climax when we accidentally stumbled into a nest of wasps. We never did reach the zenith, or summit, of the mountain to which we had been hiking. Quiz: Try again! What is a zenith? The point where something becomes dangerous. The point where something does not become fun any longer. The high point of something. Judith Reaches Zen Zenith Judith had been practicing Zen principles for a lifetime when she finally, after having turned a century in age, reached the Zen zenith of blissful enlightenment. From word roots meaning “a path over one’s head.” The zenith is the topmost point of something, or the point directly “over one’s head” in the sky. 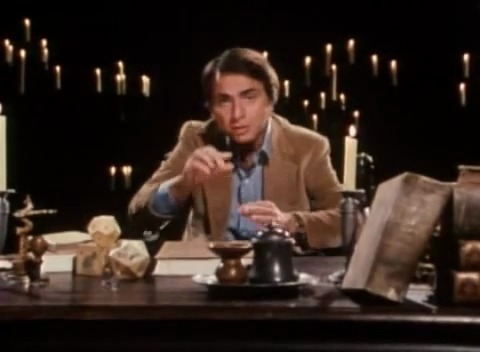 Cosmos Carl Sagan talking about the sun and its zenith.